IT'S the one thing that most passengers dread having to do - pick up the phone and try to get assistance from airline staff. Your chances of success are often quite limited, while the likelihood of getting frustrated is fairly high. However, Marla Margolis' exchange with an American Airlines employee went to another level. She had flown from Boston to Miami in February with her family, who were then set to hop on a cruise to celebrate her son's bar mitzvah. Unfortunately, they had accidentally left a garment bag containing her son's suit and daughter's dress on the plane. As she had discovered the item was missing just an hour or two after landing, Marla called American Airlines' customer service in the hope the aircraft may still be at the gate. She was simply told to make a claim online and wait for a response. "All I needed to do was to talk to a human being at the airport," she told WCVB. "I didn't need to file something and find out 48 hours later if it was found." The frustrated traveller admitted to saying something "not nice" as she hung up the phone. However, she never expected what was to happen next. Exactly one minute later, she claims she received a text message that left her gobsmacked. It read: "I will put my foot up your a** you f***ing w**re." 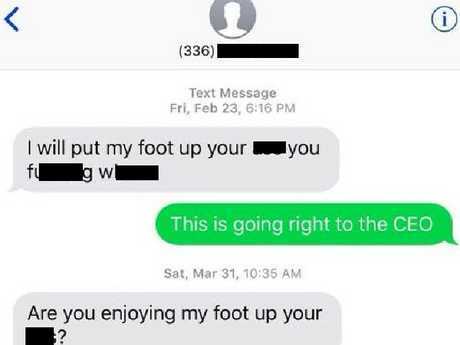 The texts allegedly from an airline worker. "I think it was the rep or his buddy sitting next to him," she said. Marla tried to call the number but it went to a default voicemail. A week later, she emailed executives at American Airlines and was told they would investigate. However, she received another text message from the same number four days later. "This is totally, off the books, crazy," she said. "I was very, very upset by the text. It wasn't that I couldn't get my answer. It was insult to injury to get this offensive text message." The area code of the call was 336, which is around North Carolina, where the airline has a call centre. American Airlines said that while it could not trace the number, the call was handled by a staff member in Phoenix, before going to a supervisor in North Carolina then on to a call centre in Raleigh-Durham, also in North Carolina. An American Airlines spokesman told WCVB that it "thoroughly investigated" the incident, including interviewing with the employees who handled Marla's complaint. But it couldn't verify her claim as the employees immediately took other calls after the conversation with Marla. Unsatisfied with the response, Marla said she has contacted local police who are investigating.